Translation is a concept like crossing borders, breaking barriers of separate cultural and linguistic entities. We make it possible for you to convey your thoughts, ideas, hopes, dreams, ambitions, experience and anything you want to people who share a different language and a different culture. Language translation allows companies to trade successfully in other countries, to reach new customers and to materialize their full marketing potential. A skilled translation work can make the distinction between a successful or ineffectual business or cultural understanding, between encouraging and preventing a sale and ultimately between being taken earnestly or not. 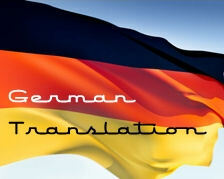 Translation is the necessity for today’s world and we are providing the German translation in its best possible way. We have chosen our native-speaking translators because of their ability to communicate the message well and because they are dedicated to make it possible for the receiver the clear and accurate understanding of the language. Translation means the accurate well-readable presentation on other language, and we can assure you for the joy of reading of thoughts. When translating specialized documents in various fields, like technical translation, legal translation or website localization, it's necessary that all the terminology is translated properly. Taken to an extreme, technical translation can literally be the difference between day and night. May be it sounds a little surprising, but think if a small wrong translation in an IT or software manual meant that the entire program or a part of it can collapse easily. For execute the translation job successfully, you need to choose a reliable translation company, on which you can trust completely. You need to be sure about the quality, time and budget meets to your need. We are in the languages translation field for last 15 years and serving small, medium and blue chip companies maintaining the hi-standard with low cost and shorter projection time. We assure you the Best of Quality in the work. If our profile matches and satisfies your requirements, we surely hold a chance with you which would be the best step towards our career growth. We are capable to give the bulk volume of translated output per day, but it depends on the nature of the input document. We can increase our translators if you have urgency for the translation. To prove our worth we can send you few samples of translation which we are currently doing and also which we have already done. Theses will tell you the quality of our work. We employ only the very best German translators the world has to offer. They are meticulously screened during our rigorous selection process so that only specialists having the best qualification, industry experience and subject expertise handle your translations. We only work with dependable and experienced translators who consistently display superior performance and quality results. We ensure that the German translators assigned to your project have the appropriate expertise required to provide you with a high quality, culturally sensitive translation in any field that you desire. German Translation Fields: Document Translation ( IT Manual, Software Manual, Multilingual User Manual, Technical Script and Manual, Training Material, Medical Documents, Engineering Documents, Marketing & Advertising, Legal Documents, Literatures, Official Papers, Tourism, Sports), Website Translation, Software Localization, Multilingual Web Publications, Web Content management and translation, Print Publications. The German language (Deutsch) is a West Germanic language (Branch of the Indo-European language family, comprising languages descended from Proto-Germanic. These are divided into West Germanic, including English, German, Frisian, Dutch, Afrikaans, and Yiddish; North Germanic, including Danish, Swedish, Icelandic, Norwegian, and Faeroese )and one of the world's main languages. German is nearly related to and classified next to English and Dutch. Around the world, German is spoken by approximately Hundred million native speakers and also about 80 million non-native speakers, and Standard German is widely taught in language schools, colleges, universities, and Goethe Institutes worldwide. German is the third most taught foreign language in the English speaking world after French and Spanish. German is the main language of about 90–95 million people in Europe (as of 2004), or 13.3% of all Europeans, being the second most spoken native language in Europe after Russian, above French (66.5 million speakers in 2004) and English (64.2 million speakers in 2004). It is therefore the most spoken first language in the EU. It is the second most known foreign language in the EU. It is one of the official languages of the European Union, and one of the three working languages of the European Commission, along with English and French. Thirty-two percent of citizens of the EU-15 countries say they can converse in German (either as a mother tongue or as a second or foreign language). German was once, and still remains to some extent, a lingua franca in Central, Eastern and Northern Europe. Kolkata Translators - Content Writing India - Language Professionals Kolkata.